A Stephen Spielberg war movie, cinematography by Janusz Kaminski, musical score by John Williams; equals a movie worthy of viewing for those three reasons alone. 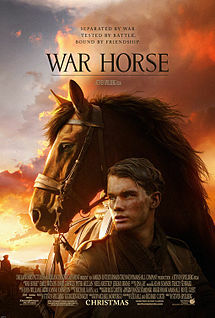 I have been fortunate to view some glorious looking movies and War Horse has jockeyed right there for the lead. Shot on location in various rural locations throughout England this is a truly glorious looking movie. At times the depth of field of the rolling, lush, and rocky hills depicting turn of the 20th century rural farm life is almost three dimensional without any technical trickery. The look of the movie changes to match the events. So, so gorgeous when it can. So horrifying when it has to be. And it makes the contrast of the hellhole that is war mutilated topography that the French countryside has been battered into, all the more shocking to behold. Structurally this movie echoes strongly the story arc of the three Lord Of The Ring movies condensed into one. Warhorse starts out in a bucolic surroundings, moves to progressively worse environments, and then returns back to the peaceful surroundings of an English Shire. To carry that analogy a bit further, one could think of War Horse as the equine edition of LOTR. It follows the journeys and tribulations of a horse called simply Joey by his first master, a young farmboy named Albert. Joey provides the narrative thread that ties together all the various tapestries; each an individual vignette about different human characters. And what a cast Spielberg has gathered together for this movie. A veritable who’s who of English character actors – many os which were recently seen in the Harry Potter movies – plus actors on the upswing such as the latest TV Sherlock Holmes – Benedict Cumberbatch, Thor’s Loki – Tom Hiddleston, and The Boxer’s – Emily Watson. Joey’s master is played by with the appropriate turn of the century innocence by newcomer Jeremy Irvine. Every cast member is uniformly excellent throughout. It is truly an ensemble piece with small moments of emotional resonances against the backdrop of a world war. Any shortcomings in the characters are tied into how well their story is tied into with Joey and his journey. And that is what Warhorse is about. Those small moments of humanity that still arise under the harsh, uncaring rigors of war. Often those moments are lost or crushed beneath the cruel boot heel of conflict. The opening peaceful moments of the movie areso light heart in nature as they play out like moments expected in family type fare. They are so rapidly and jarringly lost as the war starts. Yet throughout the war, decency & compassion survives. Whether it is between comrades, family members, or enemies. Even people and animals. Spielberg has crafted an old time movie that is simple in concept. In lessor hands this would likely be a far less emotionally resonant viewing experience. Maudlin even. In Spielberg’s hands it works. Those closing scenes; bathed in a yellowy glow, the actors in silohuette; would be cloying if done by another director. Spielberg elevates the material of a story of a boy and his horse. This is a story of the effects that wars have on everything.